Watch as people try to dig a snow plow out of 53 inches of snow that fell over two days in Erie, Pennsylvania. Meteorologists say a Christmas storm dumped a record amount of snow on the Pennsylvania city of Erie and surrounding areas. And the snow kept coming. The National Weather Service office in Cleveland says the storm brought 34 inches on Christmas Day — a new all-time daily snowfall record for Erie. Another 19 inches fell before dawn Tuesday, bringing the total to 53 inches — the greatest two-day total in commonwealth history. 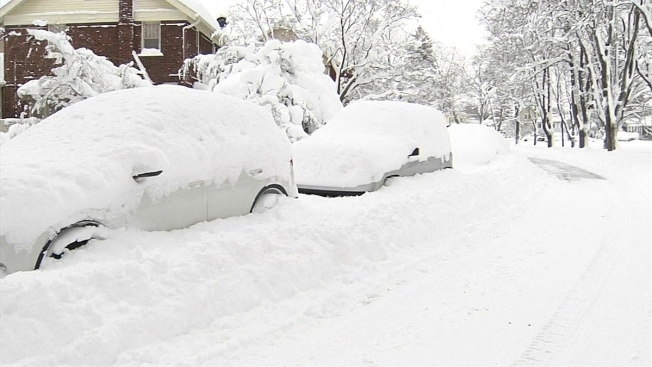 The previous record was the 44 inches that fell in Morgantown in March 1958. But the record would grow by Tuesday night, as more snowfall brought the total since Dec. 23 to more than 62.9 inches, or more than 5 feet. The city of Erie issued a snow emergency, citing "dangerous and impassable" roads, and asked residents to stay off city streets until the snow stops and roads can reopen. Cameras even captured people trying to dig out a city snow plow that became stuck in the snow. State police and the Pennsylvania Department of Transportation are urging people to avoid travel, citing poor visibility and deteriorating conditions.